A new LG handset with the model number LMV405UA was spotted passing through the Global Certification Forum (GCF). Early rumors suggest that the LM-V405UA is US version of the LG V40, and the code name of the device is Storm! 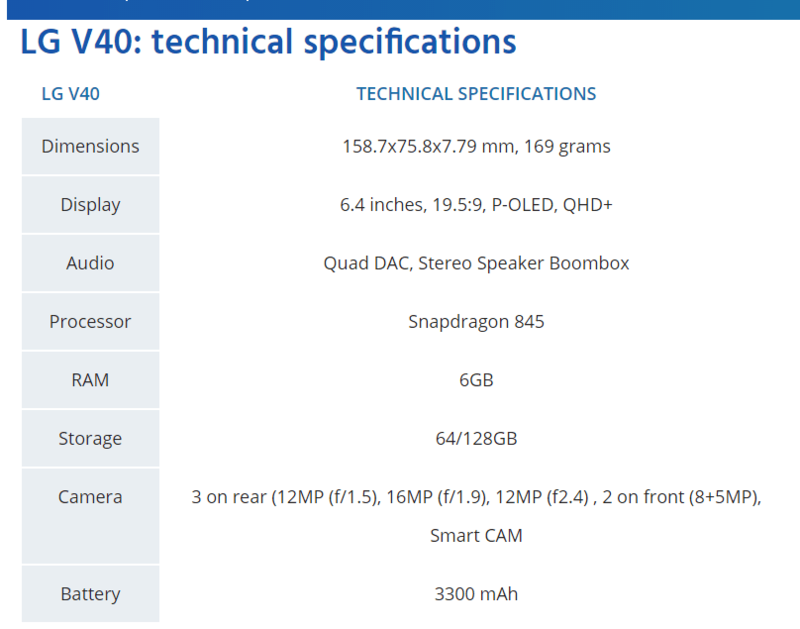 It is interesting that the LM-V405UA was listed as LG Storm PLUS. The LMV-405UA is listed as supporting LTE FDD 01, 02, 03, 04, 05, 07, 08, 12, 13, 17,20, 25, 26, 28 and LTE TDD 40,41. If you are interested to know whether the LG Storm Plus does support the bands you need it to, check the GCF listing here. The LG Storm plus (aka LG V40) will be powered by a Qualcomm Snapdragon 845 processor consisting of four 2.8GHz and four 1.7GHz cores supported by 6GB of RAM and 64 or 128GB of internal memory. Thanks to androidpit, we were able to get a look at the technical specs of the LG V40 or LG Storm PLUS!